Be an informed voter. Download VoteUp! 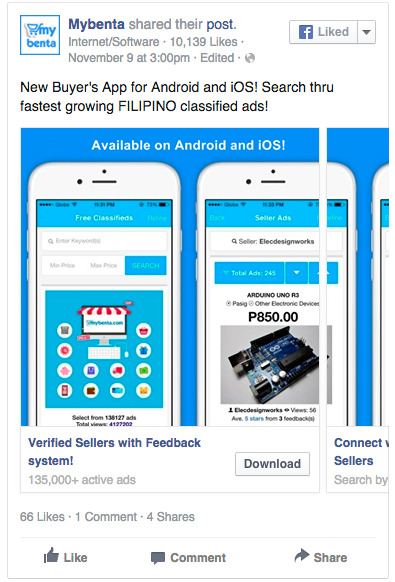 Search through thousands of ads online posted by active Filipino online sellers. THUNDER IS A TERRIFIC MALE YORKIE. FERTILE PARROTS EGGS AND NEWLY BABIES FOR SALE. Get your Verified Seller Badge for FREE! Enhance your reputation and credibility as an online seller. Please share and like our mobile app! How to top Mybenta search results & appear in Google, made for Online Sellers. Support by posting your feedback! Positive Feedback - well done keep it up good job!!! Positive Feedback - very promising site. Positive Feedback - Great site! Exciting times! Positive Feedback - keep it up mybenta! !